Summer night at Cross Bay, Chukotka, Russia. When Russians say "Siberia", they usually refer only to the inland areas of Asian Russia. 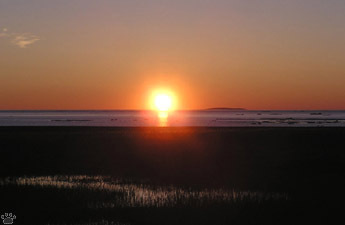 All Pacific Coast, from Chukchi Sea to Ussuriland, is called "The Far East", or RFE. 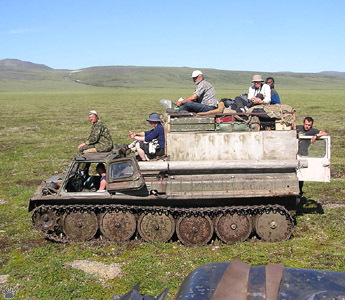 This part is much more interesting for a naturalist or a tourist than Siberia itself. Thanks to milder climate and less violent glacial history, RFE shelters the most diverse flora and fauna in the country. Still, the forces of Nature are no less savage here than in Siberia. Typhoons, tsunamis, volcanoes and snowstorms have created some of the world's most beautiful landscapes. There are only a few big cities in RFE, so in most areas the environment is in better condition than elsewhere in Asia. In some parts, native peoples are still the only source of environmental impact, and their numbers are steadily declining, mostly due to assimilation and emigration from tribal lands. 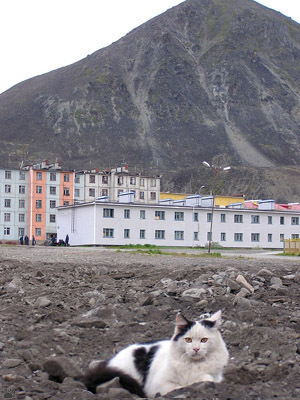 House cat, Egvenkinot, Chukotka. RFE is one of my favorite parts of our planet. In 1986-92 I've been there ten times, and visited almost all interesting places. Most photos here are from 2007 trip to Chukotka with Danish Ornithological Society, the only time I had a digital camera. 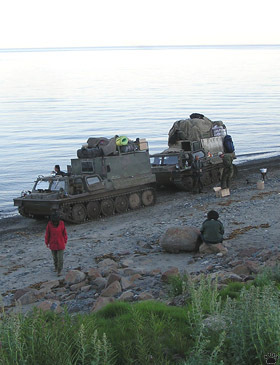 River crossing, Russkaya Koshka Spit, Chukotka. 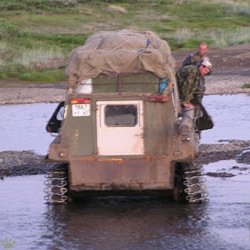 Bus on Egvenkinot-Amguema Road, Chukotka. 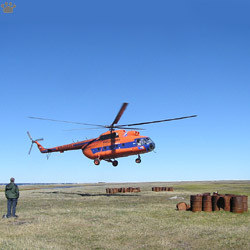 Loading a Mi-8 helicopter, Anadyr. Except for a narrow stripe along the southern border, the infrastructure in RFE is inadequate or absent. In the north there are virtually no roads. 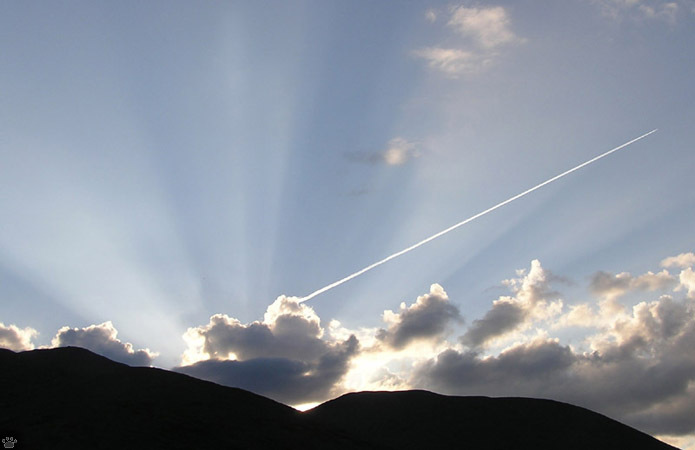 Ironically, many international air routes pass through RFE airspace. Jet (probably Seoul-San Francisco flight) over Dionisia Mountain, Chukotka. people plus a lot of luggage. Belyaka Spit. 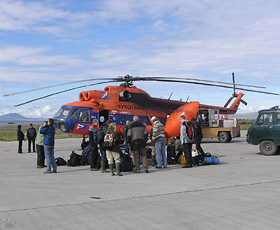 Much of the region can only be accessed by helicopter. 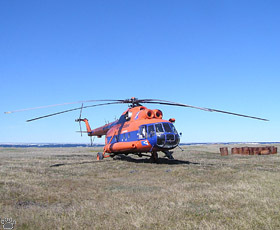 The local workhorse is large Soviet chopper called MI-8 It's always in demand, and the weather is often bad, so it's not unusual to spend weeks, even months, waiting for your flight, and then to see it usurped by a local bureaucrat. Helicopter flights here are the most expensive in the world, by the way. this might be the most beautiful sight in your life. the beach. Ioanna River. 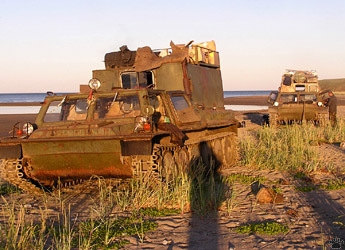 Unless you have unlimited financing, a more realistic option is an ATV, a caterpillar vehicle called vezdekhod in Russian. 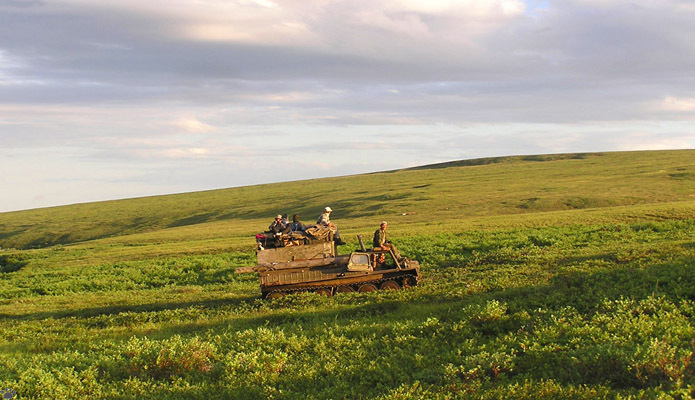 They are expensive, excruciatingly slow, noisy, uncomfortable, often break in the worst possible time and place, and damage the tundra if used in summer, but they are often the only alternative to a helicopter. Caterpillars tend to break during river crossings. 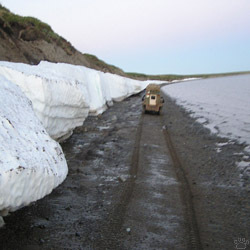 Traveling across Golden Ridge, Chukotka. 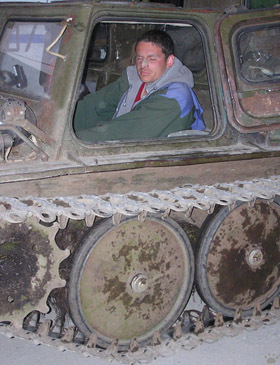 Author after four days of ATV travel, Anadyr. Many people eventually learn to enjoy ATV travel, but that doesn't make life easy. Your main problem is Russian bureaucracy - a unique mix of Soviet stupidity and ineffectiveness with corruption and greed of wild capitalism era. Add to this widespread paranoia (almost all of RFE is officially a restricted area, since the coast is considered a border). Waiting out the high tide, Ioanna River. 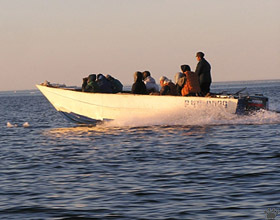 Nighttime travel with sea hunters, Belyaka Spit. 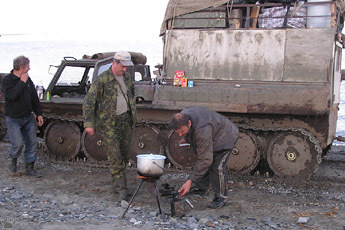 Sea hunters on the Chukchi Sea. Chukotka has the reputation for the worst bureaucracy. Everything is a monopoly here, and people are strangled by countless stupid laws and regulations. Getting anywhere outside the capital is always a problem. Looking for seals, Chukchi Sea. 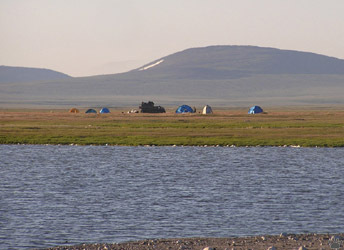 Ornithological expedition camp at Russkaya Koshka Spit. aleutica), Anadyr. There are some good biologists in RFE, and hundreds of expeditions have been working there in the last 150 years. But the Nature of RFE is so diverse that you can start making small discoveries the moment you step off the airplane. 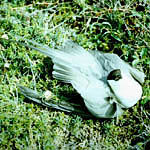 In 1991, I found a colony of Aleutian terns within one mile from the city airport of Anadyr, the capital of Chukotka. This colony was the first ever found that far north. 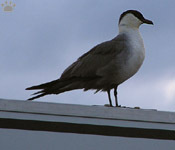 Climate change results in growing influx of southern species, especially birds, so now the Aleutian tern has become much more common and widespread than 16 years ago. 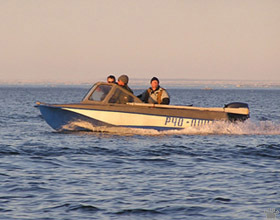 The city of Anadyr is situated in the mouth of Anadyr River. The river flows from mysterious and beautiful Elgygytgyn Lake in an ancient impact crater, then crosses uninhabited mountains and willow-covered plains. 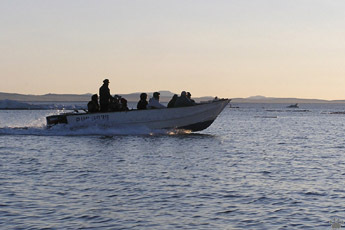 Thousands of seals and dolphins enter the river every summer, chasing salmon and herring. Lapland longspurs (Calcarius lapponicus) and especially snow buntings (Plectrophenax nivalis) are common town birds. Recently, they've been joined by dusky thrushes (Turdus eunomus), house martins (Delichon urbica), and house sparrows (Passer domesticus). sibiricus), Pohodsk, Yakutia North of Anadyr River there are no forests, only endless tundra and mountains. 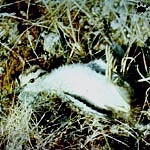 The entire life cycle of tundra is determined by "lemming years". Once in 4-5 years, lemming populations rise 20-50 times. In such years, carnivorous birds and mammals produce more offspring. Other animals also benefit from lemming years, as their natural enemies are "distracted" by this abundant prey. During the population peaks, lemmings are less shy and sometimes even aggressive. Long-tailed jaeger, Pevek. Jaegers are the most common predatory birds in Asian tundras. Of the three species, the long-tailed (Cataracta longicaudatus) is the one most dependent on lemmings, and its numbers are subject to wide fluctuations. Pomarine jaeger (C. pomarinus) feeds mostly on bird eggs and chicks in summer. Local people call jaegers "Nazis" for their habit of robbing seabirds. 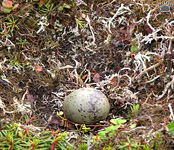 Nest of long-tailed jaeger, Coal Mines. food of all birds of prey in tundra. The coast of Chukotka is a world of shallow bays, wet and dry tundras, coastal spits, deep fjords and rocky cliffs. Its flora and fauna are a mix of Asian and American species. 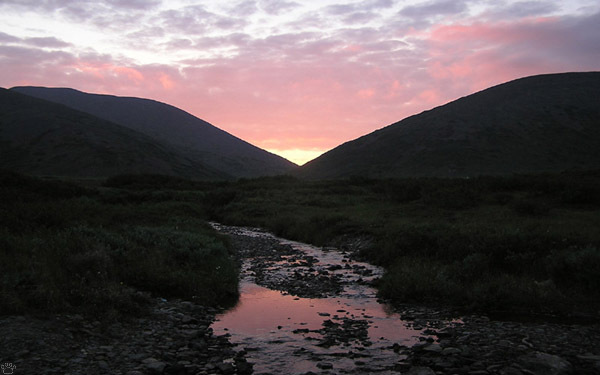 The western border of Chukotka at Kolyma River is a more important biogeographic border than the Bering Strait, which is only 92 km (58 miles) wide, with a depth of 30-50 m (100-165'). 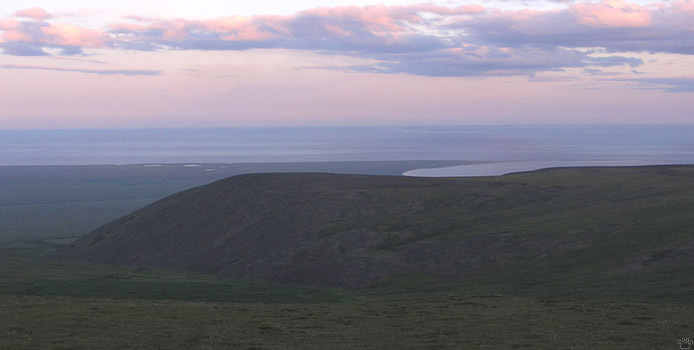 Cape Dezhnev - the Asian side of Bering Strait. 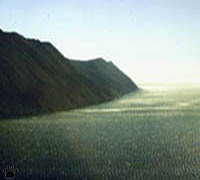 Coast of Chukotka on the northern side of the Gulf of Anadyr. Amderma, Russia Seas around Chukotka freeze in winter. Still, there is a lot of wildlife to see off the coast: walruses, seals, eiders, ivory gulls. Abundant prey attracts predators, such as polar bears, killer whales, and Arctic foxes. early spring. 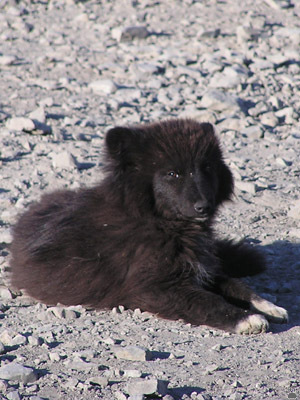 Dixon, Taimyr. Many birds leave the North at this time. There are may excellent spots to observe the migration in RFE, from Chukchi Peninsula in the north to Pigeon Rock on Korean border. 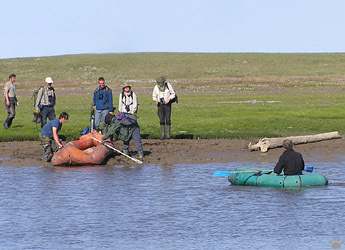 A few species, such as McKay's bunting (P. mckayi), migrate to Chukotka in winter. Black brants fly from Asian Arctic to their wintering grounds in America via polar regions. For decades, their northbound migration from the Arctic Coast supported a believe that a warm "Sannikov's Land" existed somewhere in the Central Arctic. 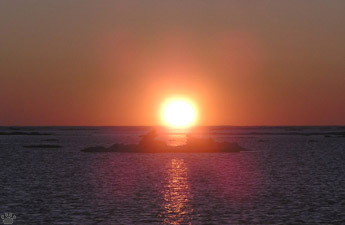 At the northern coast, the sun doesn't set for a few weeks in early summer. Belyaka Spit. Rocky coast, Vrangel Island. 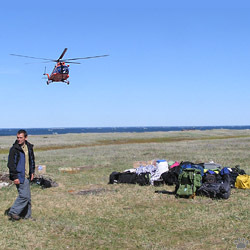 Vrangel Island north of Chukotka is one of the most important sites in Arctic for rare and endangered flora and fauna. 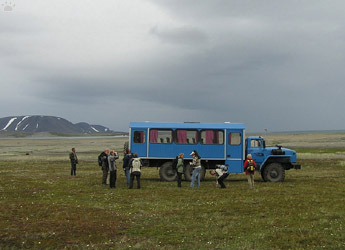 Here you can see a unique mix of Asian and American species, world's largest breeding sites of polar bear, walrus and snow goose (Anser caeruleus), and over 40 endemic plant species. 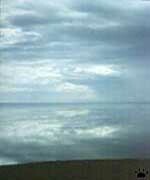 Chukchi Sea in June. 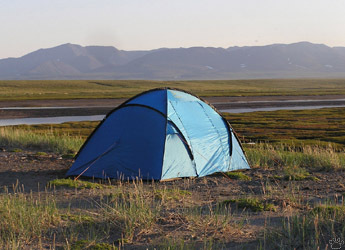 Off Vrangel I.
Arctic tundra, Vrangel I. It's been recently discovered that the island had once been a "Lost World", where mammoths had survived until relatively recent times. Humans colonized it, killed all mammoths and became extinct themselves about 3000 years ago. 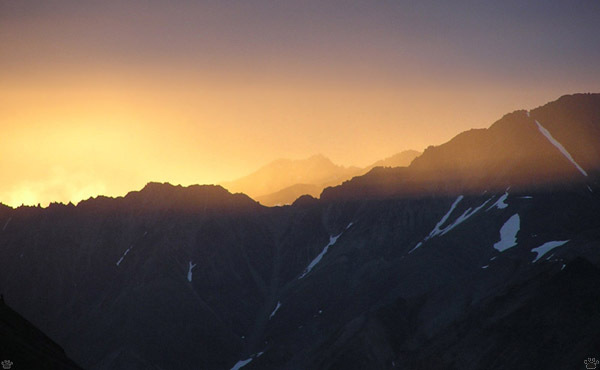 Summer night at Dionisia Mountain, Chukotka, Russia.